At least one person has died and many others are feared dead after an avalanche buried a hotel in central Italy following a series of earthquakes, CNN reports. 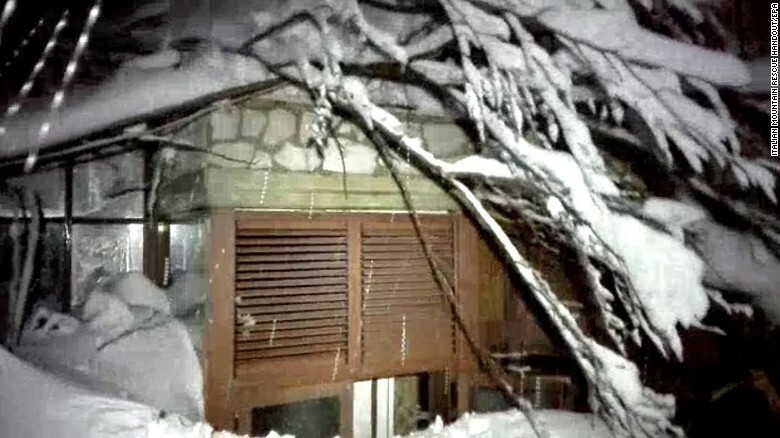 At least 22 guests and several staff members were in the Hotel Rigopiano, at the foot of the Gran Sasso mountain, when it was hit by the avalanche on Wednesday, Antonio Crocetta, a rescue group leader in the area told Italian state media. Two people have been rescued from the site, the head of Italy's Civil Protection Department, Fabrizio Curcio, said in a media briefing. Weather conditions are making the rescue operation difficult, he said. Rescue workers had not been able to reach the area until the early hours of Thursday as heavy snowfall hit central Italy for several days. The area is a popular ski destination, mostly with Italian tourists. Central Italy was rocked by more than 10 tremors on Wednesday, four of them above a magnitude of 5, according to the US Geological Survey. An initial 5.3-magnitude quake hit in the morning near the town of of Amatrice, a town devastated by powerful quakes last year. The tremors continued for more than six hours, with one as strong as magnitude 5.7. While the epicenter was 90 kilometers northeast of Rome, the quake was felt in the capital, sending people running from buildings in a panic. All the aftershocks have hit around Amatrice, in the mountainous regions of Marche, Lazio and Abruzzo. Nearly 300 people died in central Italy in quakes around Amatrice in August, and the town center, once popular with tourists, was reduced to rubble.